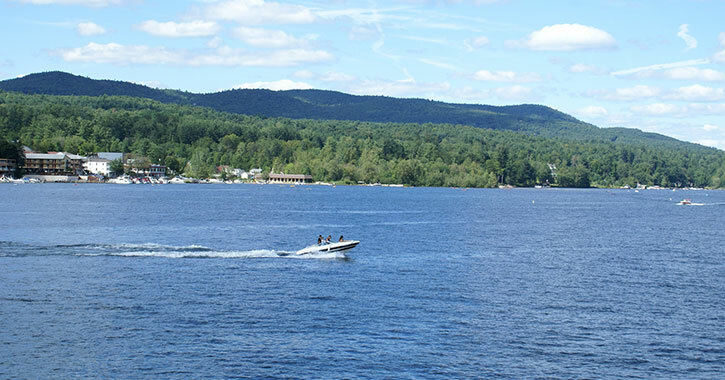 Boating on Lake George is a popular summertime tradition, but both experienced and new boaters should be aware of the lake’s special regulations. In particular, all vessels that are mechanically powered by a motor with 10 h.p. or more, or are 18 feet or longer, must be registered with the Lake George Park Commission before launch. Does Your Boat Have to be Registered? As mentioned above, New York State law requires that every vessel that is mechanically propelled by a motor with 10 h.p. or more, or is 18 feet or greater in length, must register with the Lake George Park Commission, receive a sticker, and then display it on their boat. All of this must happen before you launch on Lake George. If you have questions about whether or not your boat requires a registration sticker, you may contact the Park Commission at 518-668-9347. In order to register your boat with the Lake George Park Commission, you will need to provide your name, address, make, model, and color of the vessel, your New York State Department of Motor Vehicles (NYS DMV) registration number*, and berthing location. The Lake George Park Commission offers three types of boat registrations: one-day, week-long, and annual (good for one year). The one-day boat registration sticker is available for $12, regardless of the type or size of the vessel. These registrations expire at midnight of the effective date. The week-long boat registration sticker is available for $20, regardless of the type or size of the vessel. These registrations expire at midnight, seven days following the effective date. If you will be berthing, using, or operating a vessel on Lake George for 21 consecutive days or more, then you must purchase an annual registration. Any registration fees you have already paid for the year may be applied toward the annual registration fee. This must be done by mail or in person at the Commission’s office. The cost to purchase an annual boat registration sticker varies and is based on the length of the vessel and whether or not it’s equipped for overnight (a bed or bunk and sanitary facilities). The boat length is determined by measuring the distance from the foremost part of the bow to the aftermost part of the stern; this excludes bow pulpits, swim decks, engines, props, brackets, etc. You will receive your vessel’s length from your state boat registration. To make the process as simple as possible, you can register your boat with the Lake George Park Commission by mailing the form to their office, visiting their office in person, or registering at one of their local vendor locations.